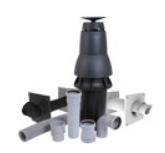 PolyPro® is superior in performance and easier to install than PVC or CPVC pipe, which were designed for irrigation, not venting. PolyPro has been successfully venting appliances in Europe for over 15 years. Tested and listed to the ULC S636 standard in Canada. No messy solvents to work with. No worrying whether it is warm enough to glue pieces together. 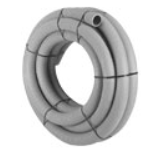 Gasket connections have a precise, tight seal and does not require installation lubricant. Terminations remain icicle free in freezing weather. Tight seal at every joint…expands and contracts with weather and temperature changes, so there is no flexing or cracking in the venting. Interior of 90° elbows are 88° to prevent standing condensation. Higher sustained operating temperatures than PVC/CPVC. Gasket connections allow for removal and replacement of components. No leaching or off-gassing of heavy metals or carcinogens. Resistant to aromatic hydrocarbons generated by gas combustion. Resistant to acids and bases. No chlorides in PolyPro, unlike PVC/CPVC.